What is it about Haiti that makes the “international community” think they have the right to decide the country’s fate without the consent of the governed? Yes, Haiti is a poor country, but Haitians have fought very hard, and lost many lives, for the right to vote and elect a government. Yet, on 28 November, nearly three quarters of Haitians did not vote in the presidential and parliamentary elections. That is what we at the CEPR found when we went through 11,181 tally sheets from the election. This is a ridiculously low turnout for a presidential election. Now, according to an AP report, the Organisation of American States has decided that the election should go to a runoff, finding that the top two finishers were former first lady Mirlande Manigat and the popular singer Michel Martelly. The OAS is proposing a runoff between presidential candidates who received about 6% and 4%, respectively, of the electorate’s votes in the first round. One reason that most Haitians did not vote is that the most popular political party in the country, Fanmi Lavalas, was arbitrarily excluded from the ballot. This was also done in April 2009, in parliamentary elections, and more than 90% of voters did not vote. By contrast, in the 2006 presidential elections, participation was 59.3%. And it has been higher in the past, even for the parliamentary (non-presidential) election in 2000. Haitians have taken great risks to vote when there was political violence, and have been pragmatic about voting even when their first choice was not on the ballot (as in 1996 and 2006). But the majority won’t vote when they are denied their right to choose. This is the big story of the election that most of the major media have missed entirely. Our recount of the vote also showed that even among the votes cast, there was a sizable proportion of votes – about 12.7% – that were never received by the Provisional Electoral Council (CEP) or were quarantined by it. This quantity is much higher than was previously reported by either the CEP or the OAS. A statistical analysis of the vote totals found that some 8.4% of tally sheets had vote totals that were irregular (that is, with irregularities that could be expected to occur by chance less that one in a hundred times). Another 5.4% of tally sheets had obvious clerical errors – for example, total votes cast exceeding the number of registered voters at a voting booth. We did not include these errors among the irregular vote totals, because they did not necessarily affect the outcome. But the high percentage of clerical errors on the tally sheets further undermines confidence in the overall results. Our analysis confirmed what many observers saw on the ground, including ballot box stuffing, fraud and people unable to vote because they did not appear in the registry. People in the areas hardest hit by the earthquake had much lower participation rates. This election was the first round of an election that was supposed to proceed to a runoff election, which has now been postponed until February. The top three finishers were Manigat, Martelly and the government’s candidate, Jude Celestin. But since second and third place were separated by just 0.6 percentage points, there is no way – given the massive irregularities – to tell which two candidates would proceed to the second round. Clearly, an election that was so severely flawed and plagued by irregularities cannot be considered legitimate. But even less excusable is the exclusion of the country’s most popular political party – the equivalent of banning the Democrats or Republicans in the United States. 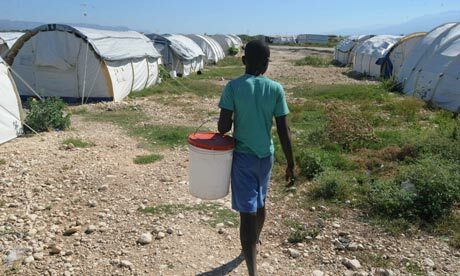 This “exclusion will undermine both Haitians’ right to vote and the resulting government’s ability to govern,” wrote 45 Democratic members of Congress to US Secretary of State Hillary Clinton on 7 October 2010. They asked her not to provide “funding for elections that do not meet these minimum, basic democratic requirements”. These pleas were ignored. Haiti’s first and last democratically elected president, Jean Bertrand Aristide, was overthrown (for the second time) in a coup that Washington helped to bring about in 2004. According to his account, he was kidnapped and put on a US plane to Africa, where he remains in exile, in violation of the Haitian constitution and international law. Washington and its allies, including the people who are currently making decisions about Haiti at the OAS, are pushing these illegitimate elections for the same reason that they overthrew Aristide, and will not let him back into his own country – in violation of the Haitian constitution and international law. These people want to determine who rules Haiti, without allowing the majority of Haitians themselves to decide. There will be resistance to this, as to the dictatorships and foreign occupations of the past. We can only hope that it does not result in similar levels of violence.